As far back as I can recall, February has always been the coldest month. This fact was reinforced on our most recent road trip to Milwaukee to visit my father, who lives in a care facility. It was the week after the Midwest was socked by blizzard-like conditions. On either side of the road, snow stretched and sparkled in the sunlight as far as the eye could see. The temperature, which dipped below zero, caused my husband to dread every refueling stop, where he had to take off his gloves to grip the cold metal of the gas pump nozzle. When he climbed back into the driver's seat, he blew on his hands to warm them up. Every time we walked across a parking lot, the crisp snow crunched beneath our feet. February, the coldest month of the year, is also the time when we celebrate warmth—warm feelings for friends and family, that is. School children collect Valentines from classmates in decorated bags and boxes, opening up the envelopes and hoping there are treats to accompany the cards. I recall grade school parties celebrated at the end of the day, when one of the mothers brought home-baked pink-and-white frosted cupcakes. Mostly, however, I remember the time we took in class to make Valentines for our mothers . . . strange, however, that we didn't think to do the same for our fathers! 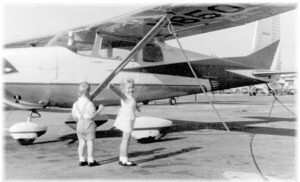 As young children, winter was not just a time for playing in the snow. Of course, we did plenty of that, too. My brother and I used to go ice skating when the creek froze, he with his hockey skates and me with my figure skates. I really did not skate well, but that was not the point. Clambering down the snowy bank to skate on the uneven ice, and making it through the chilly afternoon without complaint, was a rite of passage. After cavorting outdoors, my mother had hot chocolate waiting for us, with milk she warmed up in a pan. She stirred in spoonfuls of powdered chocolate, topping off the drink with marshmallows. The snowman in our schoolyard was invariably so big that it took a group of older boys to roll and then stack the giant balls of snow. You could see the blades of grass poking up through the trampled snow because so much of it was invested in that snowman. A snow fort took an entire week to build, and once the snowballs started flying, the bodies weren't far behind. And there was nothing as wonderful as carving a slippery slide with booted feet on the snow-covered asphalt playground. You took a running start, and then slid as far as you could on what essentially became glare ice. It was miraculous that we did not end up with broken bones. When I started second grade, my family relocated to southern California, but then returned to Wisconsin in time for sixth grade. It is odd to think about it now, but I don't remember much about those winters spent in California, possibly because one season seemed to blend into another. The first winter after we returned to the Midwest, I recall that my teacher allowed me to come in early from recess to warm up my hands at the sink, since I was not accustomed to the cold. "Use lukewarm water," she warned me, "otherwise you'll burn yourself." 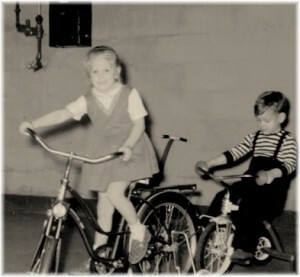 I don’t know how many people can say they learned how to ride a two-wheeler in their basement during the winter, but I can remember tilting on my bicycle seat as I adjusted to my training wheels. I rode slowly on the concrete floor, circling around the metal pipe in the laundry room and skirting the edge of the cinder block walls. When it was too cold or dark to play outside (which was often), we played board games and spread out jigsaw puzzles on the floor, put on puppet shows for our parents, and played cards. Ours was the world of black-and-white television, when there were few programs for children. I can count on one hand the cartoons we regularly watched: Mighty Mouse, Popeye, Felix the Cat, Underdog, and Rocky & Bullwinkle. We occupied ourselves in other ways, building towers and houses with very plain Lego® bricks that could not hold a candle to today’s themed sets. We read stories about the children who lived on "What a Jolly Street" in 365 Bedtime Stories, and we colored endlessly in coloring books and on blank sheets of paper. My brother and I peopled our Lego® world with paper dolls, girls for me and boys for him. I remember countless blizzards, growing up in Wisconsin, when schools closed. One time I had to walk home from school when it closed mid-day. 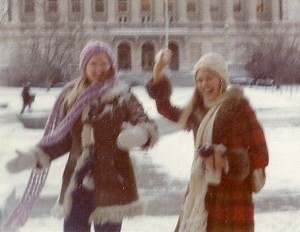 My girlfriend and I stopped at a bridal shop to warm up, where the manager gave us dress bags to wear as head scarves, since we were foolish enough to show up at school with no hats or gloves. We drank coffee to warm ourselves up, even though I detested the stuff. Still do, as a matter of fact! There was one junior high winter that I spent in Germany, staying with my aunt and uncle and studying at a Gymnasium (pronounced gim-NAH-zee-oom), the German equivalent of high school. I don't remember that the winter there was as cold as in Wisconsin, but I do recall visiting a cousin and sharing her bedroom that was so cold we slept with hot water bottles at our feet in the feather beds. In the morning, there was ice on the inside of the window. I’ll never forget how sick I was, either, when I returned home after my stay in Germany. My mother threw me a homecoming party without realizing I had the mumps, and later had to call all the guests to warn them that they could be next. Every February 6th, my parents celebrated their anniversary, usually at home. As a matter of fact, I don’t remember that my parents ever left us with a babysitter. When I was older, my mother worked first as a school crossing guard, then later directed traffic at a busy intersection in the "village." My father cut newspapers every evening for her, and layered them inside her boots for warmth. My mother was petite, just five feet and two inches tall, but she wouldn't let anyone tell her she couldn't shovel the snow on the driveway or chop the ice at the foot of it. She was strong-willed and ran the household on a strict schedule. On Saturdays, when we came home from evening Mass during the winter, my mother had a homemade navy bean soup waiting for us, along with hot, buttered hard rolls. Those early winter family memories, frozen in time, eventually gave way to adult ones. I remember the time my friend from California boarded a Greyhound bus to visit me. She had never experienced snowfall, and couldn't wait to throw herself into the snow and spread her arms wide to make her first snow angel. She snapped photos of my neighbor, who was snow blowing his driveway, and gamely agreed to board a Badger Bus in tundra-like weather to visit the University of Wisconsin campus in Madison. I don't know know what we were thinking—with the wind chill, the temperature felt like a negative sixty-four degrees! That was a typical Wisconsin winter, however. One time I visited my future in-laws in north central Wisconsin, and it was so cold that the oil in my car froze, preventing the engine from turning. John's father simply covered the car with a blanket like a baby, shifted the car into neutral and pushed it into his garage, plugging in the block heater to thaw things out. When my husband and I married, he was a Naval officer who was stationed on the West coast. The first winter after we relocated back to the Midwest, it was apparent we didn't yet have our winter feet beneath us. My husband bought bottles of Pepsi and forgot he had stored them in his car trunk overnight. In the morning, of course—you guessed it—the fluid had frozen and expanded, and the bottles then exploded. What a mess! Our son was 3 years old at the time. What struck him most about winter was the abundance of wildlife; he would follow the tracks in the snow from the squirrels and chipmunks, rabbits and birds. You wonder sometimes why anyone would live in a climate where the electrical lines can snap from the weight of ice or snow, where you can be without electricity or heat four days in a row. You wonder why anyone would move into a new house in the dead of winter. And you begin to think that people are mad when they drive their children to oratorical contests during a blizzard, or to show choir competitions 2-1/2 hours away when it's sleeting. But then there's the other side of winter, too, when you wake up late in the morning to discover that your neighbor has cleared your driveway of snow. Hoarfrost lines the tree branches with snow so beautiful it makes you race for your camera. There is nothing like sitting in front of the fireplace when it's snowing, curled up in an afghan with a book in your lap. Winter is a time to sit in front of the window and write long, newsy letters to family and friends, reflecting on the memories being created. We created our own memories this trip, visiting my father in Wisconsin who is not well. His room overlooks the park where we children used to play, near the private airport where my father used to fly a Cessna. He cracks his window open, even in the cold, for a breath of fresh air and the chance to hear the sounds of winter. He is, after all, a Midwesterner.